Modern periodic law: It states, "All the physical and chemical properties of an element are the periodic functions of their increasing atomic number". Modern periodic table: The table, which is obtained after classifying elements based on modern periodic law, is called modern periodic table. The wrong position of some elements like argon, potassium, cobalt and nickel due to atomic weights has been solved by arranging the elements in the order of increasing atomic number without changing their own places. The isotopes of some element have the same atomic numbers. Therefore, they find the same position in the periodic table. The place of hydrogen in the periodic table has not yet been solved completely. However, the hydrogen is placed in group I A of the periodic table along with alkali metals due to its least atomic number which is '1'. 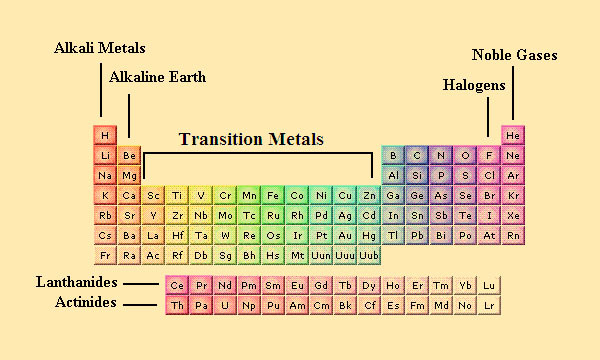 It separates metals from non-metals. The groups of the table are divided into sub groups A and B due to their dissimilar properties, which make the study of elements specific and easier. The representative and transition elements have been separated. The elements are arranged based on their increasing atomic number. There are 7 periods and 18 groups in the table. The inert gases i.e. He, Ne, Ar, etc. are kept in the 0 group at the extreme right side of the table. All the groups are divided into sub groups A and B except 0 and VIII group in the modern periodic table. Periods: Modern periodic table contains horizontal rows called periods. It contains 7 periods and are represented by n=one, n=two and so on. Short period: 1st period contains only two elements whereas 2nd and 3rd period contains elements each. So, these periods are called short period. Long period: 4th and 5th period contain 18 elements each and 6th period contains 32 elements. So, they are called long period. Incomplete Long Period: 7th period contains 30 elements and some gap left for the elements, which will be discovered in the future. So, it is called incomplete long period. Group IA elements: Elements like hydrogen, lithium, sodium and potassium, etc. are placed in group IA. They can form electropositive (monovalent) cations after losing their one valence electrons. Elements of group IA are called alkali metals as their oxides are strongly basic. Group II A: In group II A, elements like beryllium, magnesium, calcium, etc. are present. Their valency is +2 and they can form bivalent cations. They are called alkaline earth metals because they form basic hydroxides which are less soluble in water. Group VII A elements: Elements like Fluorine, Chlorine, Bromine, etc. lie in group VII A,they have seven valence electrons.So, they can give one electron and form electronegative ion during reaction. Elements of this group are called halogens as they react with the elements of group IA to give salt. Zero(0) group: Elements like helium, neon, argon, etc. are placed in this group which has stable electronic configuration. Transitional element: Those elements lying in between group II A and IIIA (i.e.fromgroup I B to group VII B and Group VIII) are called transition elements. They are called so because they have incomplete valence shell and penultimate shell. 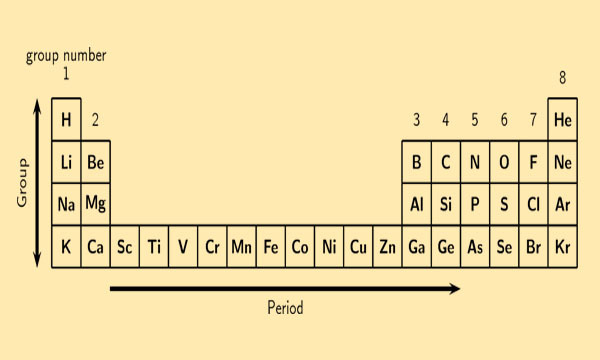 Position of metals, non-metals and metalloid: In modern periodic table, metals are placed on left side (i.e. group IA to II A), non metals are placed at the right side (i.e. group VIA, VII A) and metalloids are placed right to metals. Position of hydrogen: Hydrogen show electropositive nature by its valence electrons and sometimes it shows electronegative nature by gaining one electron in its valence shell. So, it resembles with elements of group IA and VII A. But it is placed in group IA because of its least atomic number. 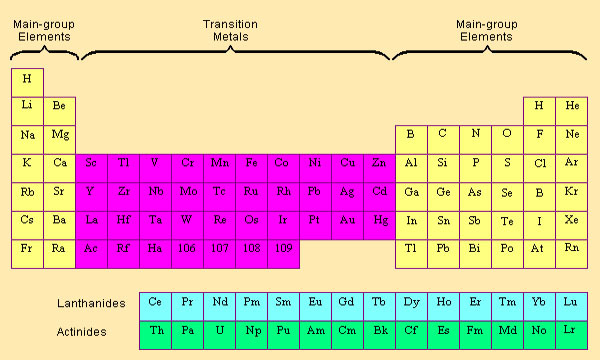 Position of f-block elements: Elements whose 4k sub shell is filled successively (i.e lanthanides and actinides) are placed separately in the bottom of the main body of the table. Modern periodic law states, "All the physical and chemical properties of an element are the periodic functions of their increasing atomic number". 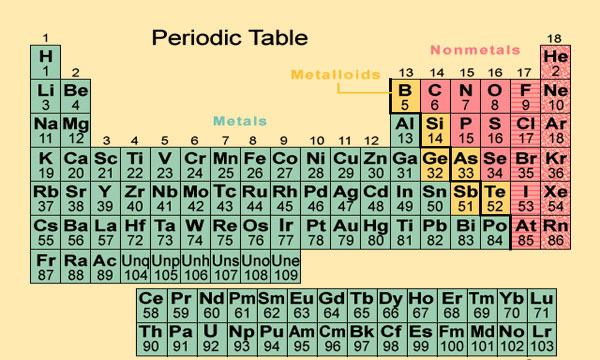 The table, which is obtained after classifying elements based on modern periodic law, is called modern periodic table. Position of metals, non-metals and metalloid, position of hydrogen, position of f-block elements, etc. are the advantages of Modern Periodic Table. Differentiate between S-block and p-block elements. i. The s-block elements include the elements of group IA and group IIA. ii. They are 12 in number. iii. These elements, either one or two valence electrons are being filled in the S-orbital. iv. The chemical reactivity of elements increases on going downwards in a group. i. The P-block elements include the elements of group IIIA, IVA, VA, VIA, VIIA and group zero. ii. They are 31 in number. iii. The valence electrons are being filled in the P-orbital of all elements of group IIIA to VIIA. The elements of group 0 have completely filled P-orbital. iv. The chemical reactivity of elements decreases ongoing downwards in group. Why are zero group elements inert? How is zero group element different from the seventh group element? The zero group element are inert because they do not take part in chemical reaction as they are I octet state with 8 electron in their outermost orbit. They do not lose or gain electrons from their outermost orbit. The zero group elements are non reactive due to their octet state which seventh groups of elements are highly reactive due to presence of seven valence electrons as they can accept one electron for the stability from other atom during chemical reaction. Which period and group do the elements A, B and C belong to? Identify the metal and non-metal from A, B and C. 1.) The element A belongs to third period and IA group. The element B belongs to second period and VIA group. The element C belongs to third period and VIIA group. 2.) The element A is metal and B and C are non-metals. i. How does the metallic character change? ii. How does the atomic radius change? i. 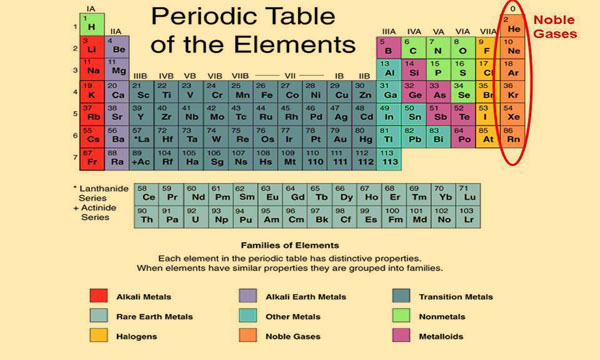 When we move from left to right in the periodic table the metallic character of the elements decreases. ii. The atomic radius of the elements decreases gradually from left to right in the periodic table. How are these elements arranged? Which one is more active between Li and Na and why? Write the formula of a compound made from Mg and Cl. Write a chemical equation for addition reaction between Mg and Cl. These elements are arranged based on their atomic number. The atomic number of elements increases as we move from left to right. Na is more active between Li and Na because the size of the atom increases as we move down and size of sodium atom is larger than that of lithium atom. So, sodium loses valence electron more easily than that of lithium atom. The formula of a compound made from Mg and Cl is MgCl2. A chemical equation for addition reaction between Mg and Cl is: Mg + Cl2 → MgCl2. What is meant by electronic configuration of elements? The systematic arrangement of electrons in various orbits or shell of an atom is called the electronic configuration of elements. State the Modern periodic law. The Modern periodic law states that, “The physical and chemical properties of elements are the periodic function of their atomic numbers”. Write any two features of modern periodic table. i. The groups are divided into sub-groups A and B to make the study of elements specific and easier. Even though the position of hydrogen is controversy, it is placed on the top of group IA due to its least atomic number. Explain the position of hydrogen in periodic table. The position of hydrogen is controversy. It has only one electron in its atom and shows many similar properties of the alkali metals (i.e. group IA) and the halogens (i.e. group VII A). It can lose one electron like the elements of group IA and also gain one electron like the elements of group VIIA in order to combine with other atoms. Hydrogen gives typical physical and chemical properties of non-metal. However it is placed at the top of group IA due to the least atomic number. Write two characteristics of modern periodic table. The groups are divided into sub-groups A and B to make the study of elements specific and easier. The elements which are arranged between IIA and IIIA in the periodic table are called transitional elements. The outermost cells and the penultimate shells in these elements are incomplete. What do you mean by Lanthanides? Why is it kept separately in the periodic table? In which period potassium and calcium lies in the periodic table, among them which one is more reactive? Lanthanides are a group of 15 elements from 57 La to 71 Lu. They are kept separately in the periodic table as they have properties similar to Lanthanum (La) and cannot fit in the provided space in the periodic table. Potassium and Calcium lie in the fourth period and Potassium is more reactive than calcium because the reactivity increases when we move from right to left in a period. What are advantages of modern periodic table? The position of some elements like argon and potassium, cobalt and nickel, etc. due to atomic weight, has been solved by arranging the elements in the order of increasing atomic number. The isotopes of elements find distinct position. The position of hydrogen is controversy. However, it is placed on the top of the group IA due to its least atomic number. The groups are divided into sub-group A and B. It makes the study of the elements specific and easier. How is Modern periodic table superior to the Mendeleev's periodic table? The modern periodic table is based on the atomic number which is more fundamental than the atomic weight. It relates the position of an element in the periodic table with its electronic configuration. It removes the drawbacks about the position of isotopes in the Mendeleev's periodic table. Representative and transition elements have been separated. It separates the metals, metalloids and non-metals. Groups are divided into sub-groups for the element with similar properties. On what factor does the valency of an element depend? The valency of an element depends upon the number of electrons of the outermost orbit of an atom i.e. valence electrons. The electrons which remain on the outermost orbit of the atom are called valence electrons. What do you mean by octet rule? The tendency of an atom to achieve eight electrons in its outermost orbit for the stability during chemical reaction is called octet rule. Why do metallic properties gradually change into non-metallic in the same period? On moving from left to right in same period, the metallic character of elements decreases as the electropositive character of element decreases and the electronegative character increases. Therefore the metallic properties gradually change into non-metallic properties. What is the common name given to the group IA elements in the modern periodic table? Explain why the reactivity of group IA elements increases as we go down the group. The group IA elements in the modern periodic table are known as alkali metals. When we go down in the group IA, the distance between nucleus and outermost orbit of atoms increases and attraction force between nucleus and electrons of the outermost orbit decreases that helps to lose the electrons more easily during chemical reaction. Therefore, the reactivity of group IA elements increases as we go down the group. Atomic number of elements A and B are 8 and 13 respectively. Answer the following questions on the basis of that. i. Give the electronic configurations of element A and B on the basis of sub-cell. Both A and B belong to the P-block in the periodic table. In which groups of the modern periodic table are there very active metals and very active non-metals? Clarify the relation between the size of the atoms of these metals and non-metals with their chemical reactivity. Write the formula equation for the chemical reaction between any one of very active metal and very active non-metal. What type of chemical reaction is it? This is combination chemical reaction. Write down the electric configuration of the element which lies in second period and sixth group of the modern periodic table based on sub-shells. Molecular formula of a certain ionic compound is 'XY2' and 'X' is a metal. State group to which elements 'X' and 'Y' belong to in the periodic table. The electric configuration of the element which lies in second period and sixth group of the modern periodic table based on sub-shells is 1s2, 2s22p4. The element 'X' belong to the group- IA and the element 'Y' belong to the group VIIA, if 'XY2' is the ionic compound. Both chlorine and fluorine elements are electronegative. As the size of the atom of fluorine is smaller than the size of the atom of chlorine, the attraction force of the nucleus of fluorine is greater than the nucleus of chlorine. As the result, fluorine atom can attract the electron of other elements than chlorine atom during chemical reaction. Therefore, fluorine is more reactive than chloride. Arrange the following metals according to their chemical reactivity: gold, silver, iron, aluminum and copper. The electric configuration of two elements is given below. Name these elements. Write a molecular formula of the compound formed by the combination of these elements. Write the chemical equation for the chemical reaction takes place when thus formed compound is treated with the hydrochloric acid. The molecular formula of the compound forms by the combination of these elements is Na2O. Write down the electronic configuration of atoms having atomic numbers 24 and 29 , in terms of s,p,d and f.
Elements in the same group have similar ______. The primary difference between the modern periodic table and Mendeleev's periodic table is _________. As you move from top to bottom down the periodic table _______. Elements in the modern periodic table are arranged on the basis of their ______. The least reactive elements of the periodic table are ______. Which statement applies to the halogens? The halogens have high electron affinity values. why noble gas named so? 1) Why electron is not drop in the nucleus? 2) electron have not self power? Any Questions on 'Modern Periodic Table '?